How are Aschiuta and Nightmare getting along? Oh, just fine. Aschiuta is Nightmare's best friend, only Aschiuta doesn't know it. Aschiuta had always been an only pet and she was also somewhat spoiled (yes, our fault). She had also started to fight easily with other dogs, which is why she hasn't been able to socialise much. When Nightmare first came in our home, she was kept in the kitchen and Aschiuta in the living room. We knew that if they got to meet, all hell might break loose. We worked from home as much as we could those days, to help them accommodate. My husband made a sort of barrier in the living room doorway out of a chair, boxes and a clothes dryer so the dogs could see each other, but not make actual contact. Things were ok so we moved to the next step. Nightmare's first visit to the living room. We were of course both there, with treats for everyone. Aschiuta was the queen of the bed, so she would need to understand that Nightmare was welcome there as well. Little by little, they eventually both ended up on the bed, getting pets and treats from us. It took quite a few visits like this until they could both get along without supervision. Aschiuta also visited the kitchen where Nightmare was living. 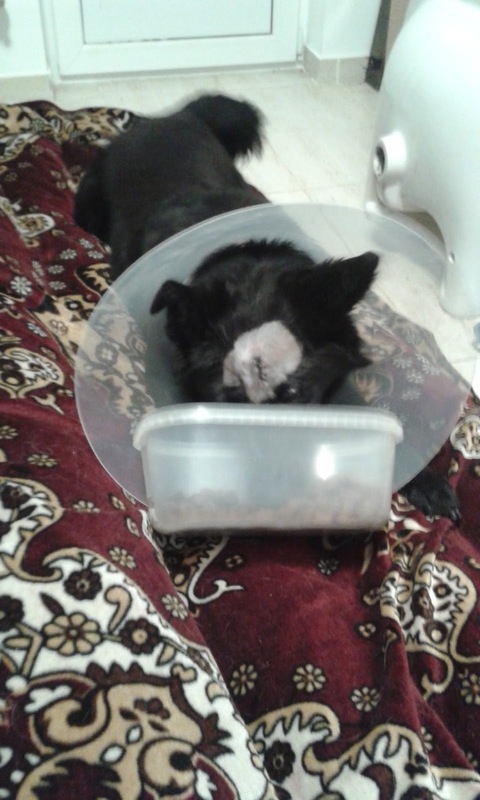 She even tried to steal her food, which we discouraged. I will admit, I sometimes gave them different kibble and that might have sparked some fights, but they eventually understood that each has her own bowls and they would get the same food and the same treats. There have been fights unfortunately. Some just because Aschiuta was angry about Nightmare for some reason, some for territory dominance and some for treats. Something we hadn't noticed at first was that Nightmare would try to store her treats away somewhere instead of eating them on the spot. Aschiuta would then find the treats and fight Nightmare for them. The fights never left any serious damage. I think they mostly barked and tried to lightly nick each other's faces. We were always there to break off the fights, holding them both at arm's length by the nape until they calmed down. I think their fights hurt me more than it hurt them. Lately, the fights have been very rare and we are happy for that. We also always make sure Nightmare eats her treats, rather than trying to hide them in my potted plants. 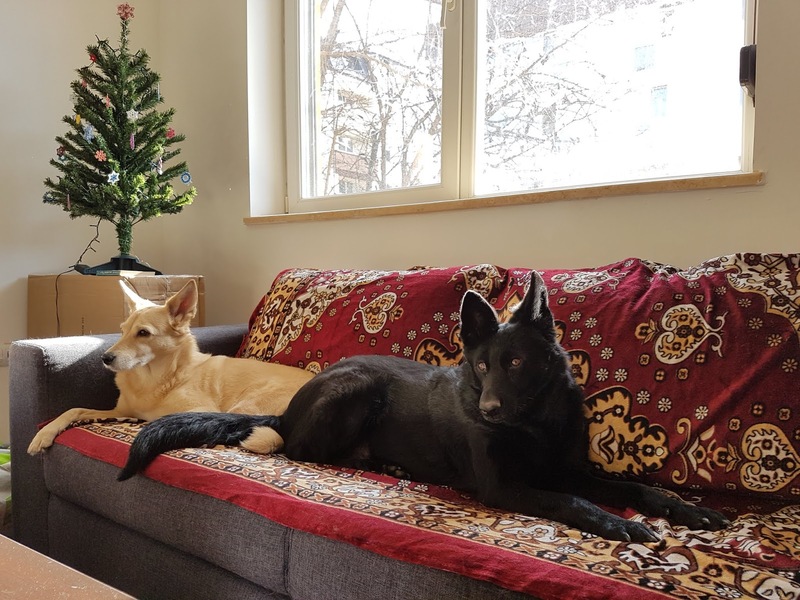 We are happy to say that they now get along quite well, Nightmare still gets Aschiuta annoyed when she is too jumpy and Aschiuta doesn't like to play with Nightmare much, but they are definitely on the right track. You took a dog in off the streets and decided to take care of it for a few days. You figure the usual commands you use for the other dog in the family should work for the new one as well. Ok, good. But then you need to use a name before the command, so that the dogs know who is supposed to follow it. What do you name a "temporary pet"? I called her Girl a lot at first, as well as Negruta (Romanian for Blackie) because she reminded me of another black dog called Negruta. The people at the vet clinic called her Blackie. Then we realised we would be keeping her for longer, so we sat down to think about the name properly. Of course, Negruta and Blackie are all valid regular names for a female black dog, right? Nope, my husband doesn't do regular pet names. His two cats (now his mother's cats) are called DJ (short for Destroyer of toys, but in Romanian) because he always broke his toys and Pitica (the English equivalent would be Tiny one) because he rescued her as a kitten and she was very small and frightened. Our first dog is called Aschiuta (which means Little splinter) because she chewed on wooden table legs until splinters came off. So the new dog also needed a special name. He must have been brewing his idea for a while, because he immediately said we should call her Nightmare. Why Nightmare? Because the first few nights that she was with us we were so worried about her that we lost a lot of sleep. So she was our little nightmare. I was reluctant at first, because I was still biased on Negruta, but he convinced me. Now I am very comfortable going around calling her Nightmare and she also seems to have learned it is her name. Of course, people were surprised when they found out about the name (one of our neighbours said to me "Sure, your husband is a rocker, what else do you expect?") - especially the ones who knew how gentle she was - but our friends got used to it as well. I must say, even if she looks a bit scary, she is the loveliest nightmare we have ever had! She is a real sweetheart, but people who meet her for the first time are prone to believe she has a nightmarish temper! We were scheduled to go to the vet with her to get some tissue samples under anaesthesia. The doctor and a nurse got ready and took the dog in one of the back rooms for the surgery and we were asked to wait in the waiting room. Of course we asked to join her as moral support, but we were politely asked not to. My husband said he would go to a shop a few streets away to take out money from the ATM machine and also buy a few snacks. I waited patiently, tried to read, stare at the walls, make small talk with the older nurse, but I just couldn't concentrate. It was taking too long. The surgery and my husband's trip. Although my watch was telling me otherwise. I should know, I stared at it every other minute. Luckily, the older nurse was allowed to peek into the back room, so she checked and told us the dog was safely sedated and didn't show any problems. My husband was finally back and we waited together, sampling some ridiculous "fruit water" he had found at the shop. The surgery really was taking too long. After about two hours or so, the older nurse came in to tell us the doctor was stitching up the dog's forehead and she would be awake soon. When the doctor came out, we bombarded him with questions. He had in fact cleaned out the infection completely, so it should heal without any more medication. He had also taken the tissue samples and would send them to a laboratory. He was very optimistic about the black dog. We asked if we could go see her. He said yes, so we hurried to the room. She was lying on the floor, crying and trembling. She was trying to move, but her muscles were no help. Her pupils were dilated and I doubt she was able to see anything. My husband said her hearing sensitivity was most likely also heightened. We stayed with her, petting her, holding her and preventing her from hurting herself. She gradually stopped whining and her pupils adjusted. She was eventually able to lift her head, then stand up. Meanwhile, my husband went to the front to pay, when he realised he had forgotten to take out the money from the ATM. He had taken the card back but not the money. The vet needed cash for the lab tests because he had to pay them in cash too, so we drove back to the shop (it was the closest ATM) and we took out more cash. He was also able to confirm with the shop manager that nobody had taken the money and the machine had retrieved the bills. We hurried back to the vet and I waited in the car while my husband went to pay and fetch the dog. When he came back, he said the vet had undercharged us - we pair only the lab tests and the anaesthesic (probably less than the normal fee). He had insisted to pay more (we are not short on money anymore), but the vet would not have any of it. He had also taken to the gentle black dog. My husband afterwards sent the vet a couple of small gifts to thank him for helping us with the dog. I also included a couple of tatted trinkets for the nurses. 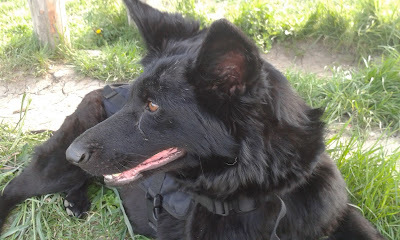 The test results were in shortly and turned out fine, so the black dog should have no complications. We would still need to take care of her head and make her wear a protective collar, but she was going to be OK.
Our dear little Frankenstein's monster having breakfast in bed.